World’s most celebrated visual telescope orbiting our Earth is the famed Hubble Space Telescope. It is needless to say that human kind learned whatever it could about the outer space simply through observations made by naked eyes until a man named Galileo Galilei turned his telescope towards sky for the first time some 400 years ago. From that day, our notion of the space changed and so did our society as a whole. Then came more powerful telescopes – bigger and better. Still, something was not right. Yet again everything changed when Hubble Space Telescope opened its eyes for the first time. And still, something was not right. In this article on Hubble Space Telescope facts, we are going to learn a lot about this living legend of a machine. Are you ready to learn some incredible facts about Hubble Space Telescope? 1. Hubble Space Telescope takes its name from Edwin Hubble – an astronomer of indisputable repute. 2. Edwin Hubble, while he was working at Mount Wilson Observatory in the year 1923, understood that Andromeda was not a nebula but a separate galaxy that sat hundreds of thousands of light years away from our Milky Way galaxy. 3. In 1929, he said that we don’t live in a static universe (as believed earlier) and showed evidences that galaxies are moving away from each other at a very constant rate. 4. Edwin Hubble eventually died in year 1953 but the space telescope that bears his name has managed to prove many of his theories and even fine-tuned some of the theories. 5. Did you know that the idea of a space-based telescope was not really conceived by Edwin Hubble? It was Layman Spitzer who conceived the idea. 6. In 1946 (just after the World War II ended), Layman Spitzer understood and identified that a space-based observatory would be far better than any ground-based observatory. 7. Why better? Because, (a) a space-based observatory will be far beyond the light pollution we have on Earth; (b) there will be no obstruction from cloud or rain; and (c) there will be not atmospheric distortions. 8. No wonder, Spitzer started pushing for a space-based telescope throughout the majority of his career. 9. NASA finally started planning for one such space-based observatory in the 1970s. 10. The funding for building a space-based telescope was eventually appropriated by the US Congress in the year 1977. 11. Eventually the Hubble Space Telescope was built and it was proposed that the telescope would be launched in 1983. 12. But, the launch never happened in 1983 because of technical problems and also because of budgetary constraints. 13. Then came the ‘Challenger disaster’ on January 28, 1986. The space shuttle broke apart only 73 seconds of flight and claimed the lives of all 7 astronauts onboard. 14. Challenger disaster left the Hubble Space Telescope without a ride to the orbit because it the Challenger shuttle that was supposed to carry Hubble Space Telescope to orbit and was also supposed to carry out maintenance. 15. The delay allowed upgradation of the sensitivity of the instruments of the telescope along with additional refinement of the control software on ground. 16. However, during this period, Hubble had to be stored in a high-tech room that was clean. The storage and upgradation of the telescope increased the costs. 17. Finally, Discovery shuttle took off with Hubble Space Telescope in its cargo bay in 1990. Unfortunately, by then the budget for Hubble had increased by more than USD 1 billion and the scheduled launch was delayed by 7 years. 18. Hubble Space Telescope was launched on April 24, 1990 and it was deployed on April 25, 1990. 19. The telescope was not built by NASA alone. The ESA or the European Space Agency contributed to the development of it. 20. The targets for Hubble Space Telescope are selected by the Space Telescope Science Institute (STScI). The same institute process the data received from Hubble. 21. Did you know that the Hubble Space Telescope is not only a space telescope but an observatory and a spacecraft? Actually, the telescope is housed inside a spacecraft. 22. The Goddard Space Flight Center controls the Hubble spacecraft from the ground. 23. Different organizations were responsible for building the Hubble Space Telescope. For instance, the telescope was designed, developed and constructed by Marshall Space Flight Center. 24. Goddard Space Flight Center was responsible for developing the over controls for the telescope’s scientific instruments as well as the ground-based command center. 25. The development of the Fine Guidance Sensors and OTA or Optical Telescope Assembly was the responsibility of Perkin-Elmer – an optics company. 26. It was the Marshall Space Flight Center that commission the Perkin-Elmer company. 27. Finally, it was Lockheed that was responsible for constructing as well as integrating the spacecraft in which the telescope was to be housed. 28. The original estimated cost of building Hubble Space Telescope was around USD 400 million. However, the increase in costs during development phase and the subsequent delays in storage (because of Challenger disaster), the final budget at the time of its launch was a staggering USD 4.7 billion! 29. It was the STS-31 mission (35th mission of American Space Shuttle Program) that launched Hubble Space Telescope and deployed it into Earth Orbit. 30. The space shuttle Discovery took off from Kennedy Space Center, Florida from Launch Complex 39B. 31. It was launched on April 24, 1990 using space shuttle named Discovery. 32. 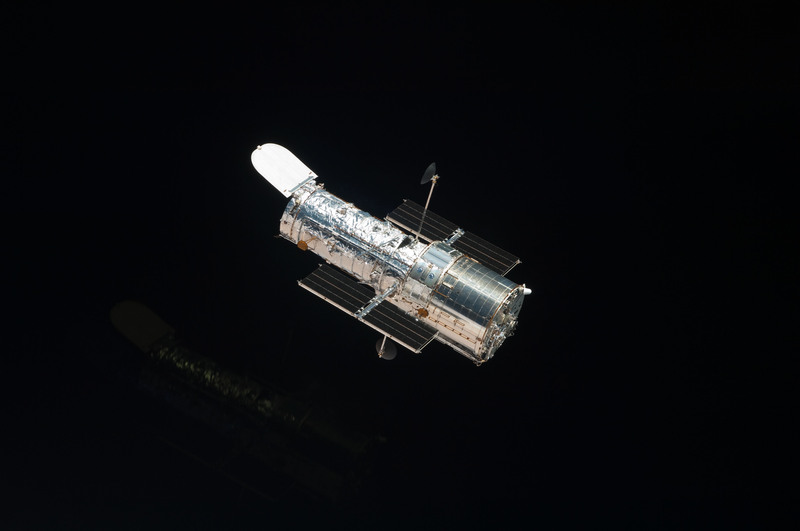 The crew on Discovery deployed the Hubble Space Telescope on April 25, 1990. 33. The first image clicked by Hubble was on May 20, 1990. The image was of star cluster named NGC 3532. 34. The first servicing mission (SM 1) took place in December 1993. 35. The second servicing mission (SM 2) took place in February 1997. 36. The third servicing mission (SM 3A) took place in December 1999. 37. The fourth servicing mission (SM 3B) took place in February 2002. 38. The fifth servicing mission (SM 4) took place in May 2009. 39. The total length of the telescope (including the spacecraft in which it is installed) is 13.3 meters or 43.5 feet. That’s the length of a large school bus. 40. When it was launched, the total weight of the Hubble Space Telescope was 10,886 kilograms or 24,000 pounds. 41. After the fifth servicing mission was completed, the total weight of the telescope increased to 12,247 kilograms or 27,000 pounds. 42. The maximum diameter of the telescope is 14 feet or 4.2 meters. 43. Hubble Space Telescope is located at an altitude of 340 miles (or 547 kilometers or 295 nautical miles) above Earth’s surface. It is in Low Earth Orbit. 44. The telescope has an inclination of 28.5 degrees to the equator of the Earth. 45. It takes approximately 95 minutes to complete one orbit around Earth. 46. The spacecraft travels at a speed of 27,300 kilometers per hour or 17,000 miles per hour. 47. The telescope has two mirrors – Primary and Secondary. The primary mirror has a diameter of 2.4 meters or 94.5 inches. 48. The secondary mirror is smaller in size with a diameter of 0.3 meters or 12 inches. 49. The primary mirror has a weight of 828 kilograms or 1,825 pounds. 50. The secondary mirror has a weight of 12.3 kilograms or 27.4 pounds. 51. The telescope transmits a whopping 150 gigabits or raw data to Earth every week. 52. Hubble uses the Sun as its power source. 53. There are two solar panels attached to the spacecraft with each measuring 25 feet in length. 54. The total power generated by the two solar panels is 5,500 watts. 55. The average power that it uses is 2,100 watts. 56. So, what happens to the remaining power? The excess power that the two solar panels generate is stored in 6 nickel-hydrogen batteries. 57. The total storage capacity of these 6 batteries is equal to the storage capacity of 22 car batteries. 58. The telescope’s pointing accuracy is quite unbelievable. The reason for such accuracy is that in order to be capable of capturing the images of faint and distant objects, Hubble needs to be very steady and very accurate. 59. It has been designed to lock on to its target with a maximum deviation of 7/1000th of an arcsecond. 60. What does that mean? It means that the maximum deviation of Hubble is equal to width of a strand of human hair when it is viewed from a distance of 1 mile or 1.6 kilometers. 61. Hubble Space Telescope can see in ultraviolet through infrared (115-2500 nanometers). 62. Did you know Hubble cannot hold any more than 5 scientific instruments at any given point in time? Apart from 5 instruments, Hubble also has FGS or Fine Guidance Sensors. 63. The Fine Guidance Sensors are primarily used for aiming Hubble to a specific target however, they are occasionally used for astrometry. Goddard High Resolution Spectrograph (GHRS). HSP or High Speed Photometer. FOC or Faint Object Camera. FOS or Faint Object Spectrograph. 67. Over years instruments were replaced during servicing missions with more advanced ones. After the final servicing mission conducted in 2009, there are total of 4 active instruments on Hubble with the 5th instrument kept in hibernation. Advanced Camera for Surveys (ACS): Active since 2002 to till now. Cosmic Origins Spectrograph (COS): Active since 20009 to till now. COSTAR or Corrective Optics Space Telescope Axial Replacement: From 1993 to 2009. Faint Object Camera (FOC): 1990-2002. Faint Object Spectrograph (FOS): 1990 to 1997. Fine Guidance Sensor (FGS): 1990 to present. High Speed Photometer (HSP): 1990-1993. Goddard High Resolution Spectrograph (GHRS): 1990 to 1997. NICMOS or Near Infrared Camera and Multi-Object Spectrometer: 1997 to present (currently in hibernation since 2008). STIS or Space Telescope Imaging Spectrograph: 1997 to present but became non-operational from 2004 to 2009. Wide Field Planetary Camera or WFPC: 1990 to 1993. Wide Field Planetary Camera 2 or WFPC2: 1993-2009. Wide Field Camera 3 or WFC3: 2009 to present. 69. COSTAR has an interesting history. The primary mirror that went up with Hubble in 1990 had a wrong shape because of polishing error. As a result, the first images that the telescope sent were not as sharp as expected. 70. This polishing error caused spherical aberrations for the light that was focused at GHRS, FOS and FOC. To correct these errors COSTAR was designed that was fitted on Hubble during the first servicing mission. 71. COSTAR was installed on Hubble in 1993 (during the first shuttle servicing mission) but NASA had to remove HSP or High Speed Photometer to accommodate COSTAR. 72. By 2002, the original instruments that required COSTAR for fixing the spherical aberrations had been replaced by instruments that came with their own corrective optics. 73. COSTAR was eventually removed and brought back to Earth in 2009 during the last servicing mission. 74. COSTAR is today kept on display at National Air and Space Museum. 75. The area that was occupied by COSTAR was emptied and now it is taken up by COS or Cosmic Origins Spectrograph. 76. A little over one month after the deployment of Hubble on 25th April, 1990, the telescope took its first image. 77. The image was of star cluster NGC 352 that was located at a distance of 1300 light years. Unfortunately, the image did not turn out great. 78. It is a common practice that the first image shot by a telescope is not made public because it is almost always unimpressive. The first image is always a test. 80. The first picture clicked by Hubble was only 50% sharper compared to the ground-based telescope that was mounted in Chile. 81. The image was unimpressive because of the manufacturing defect of the primary mirror. As explained earlier, COSTAR was designed to get rid of the problem. 82. After the servicing was completed, Hubble sent the next photograph in December 1993. Ever since then, Hubble has taken some of the most stunning images of the incomprehensible universe. 84. Did you know, Hubble has made well over 1.3 million observations ever since it was deployed in 1990? 85. More than 15,000 scientific papers have been published by astronomers using the data sent by Hubble. 86. Those 15,000 scientific papers have been cited 738,000 times in other papers! Hubble Space Telescope is the most productive scientific instrument ever built by mankind. 87. Hubble never goes to other planets or stars or galaxies. It whirls around the Earth and clicks pictures of other planets, stars and galaxies. 88. Circling the Earth, the telescope has traveled a whopping 4 billion miles. 89. Because Hubble’s vision is not blurred by the distortions caused by Earth’s atmosphere, Hubble is capable of distinguishing between astronomical objects with angular diameter of only 0.5 arcseconds. That’s like figuring out the width of a dime from a distance of 86 miles! 90. The resolution of Hubble Space Telescope is 10 times better than what is achieved by larger ground-based telescopes. 91. The extremely high resolution of Hubble allows it to locate extremely faint objects like dust disks around stars or even glowing nuclei at the center of extremely distant galaxies. 92. 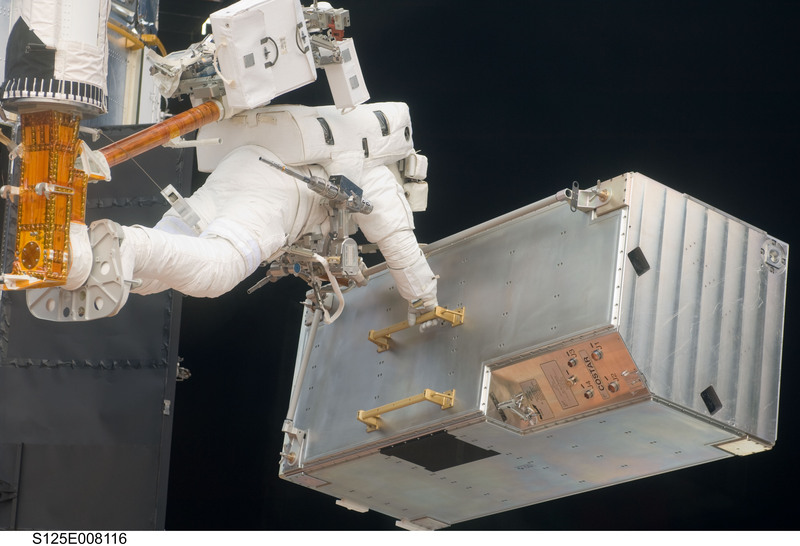 We said earlier that Hubble has 6 nickel-hydrogen batteries that store the electricity produced by the solar panels. These batteries provide the spacecraft with necessary power for operation when the telescope enters the shadowed portions of its orbit. 93. The telescope uses the backup power when the Earth blocks Hubble’s view of the Sun. 94. The telescope uses only 2100 watts of power. That’s not really much. Did you know there are kitchen kettles that use 2200 watts of power? 95. The telescope has 4 reaction wheels located at the center of the spacecraft near its center of gravity. 96. Each of these reaction wheels weigh 100 pounds. These wheels are used by the spacecraft to reorient itself. There are no thrusters for this job. 97. The reaction wheels make use of Newton’s Third Law of Motion which states that for every action, there is an equal and opposite reaction. 98. So when a wheel turns in one direction, the telescope reacts by turning to the opposite direction. 99. The ground-based command and control center sets the target for Hubble and uploads it to the telescope. 100. The main computer of Hubble then uses the data to determine which reaction wheel should slow down and which one should spin faster and in which direction so that the telescope reorients and locks on to its target. 101. To detect the direction and the rate of its motion, Hubble makes use of high precision gyroscopes. In total there are 6 gyroscopes on Hubble. 102. The typical operating mode of Hubble only requires 3 gyroscopes. The remain three are back up gyroscopes because gyroscopes eventually wear out and then fail. 103. Did you know, two out of six gyroscopes of Hubble have already failed. The first one failed in March 2014 and the next one failed in April 2018. 104. Hubble also has backup modes for operation that will allow the telescope to operate with a single gyroscope. However, working with a single gyroscope will slightly reduce the efficiency of Hubble. 105. Hubble Space Telescope needs to stay virtually motionless while making an observation. While gyroscopes help to attain this, there are three FGS or Fine Guidance Sensors on the telescope that act with its control and pointing system to keep the observatory motionless during observations. 106. Here is one of the most surprising of Hubble Space Telescope facts – when locked on to its target, Hubble jitters only 7 milliarcseconds in 1 day or 24 hours. 107. How difficult is that? It is like shining a laser beam on dime for 24 hours from a distance of 200 miles! 108. Have you ever wondered how a ground-based command and control center communicates with Hubble? There are two high-gain antennas on Earth are located in White Sands Test Facility in White Sands, New Mexico. 109. These antennas (each having a diameter of 60 feet) send the commands to Tracking and Relay Satellite System – a NASA satellite in geosynchronous orbit. 110. The satellite then sends over the command to Hubble Space Telescope. 111. Hubble transmits its collected data in the same fashion. The data is fed to the Tracking and Relay Satellite System. 112. The satellite then relays the data back to Earth that is captured by one of the two high-gain microwave antennas. 113. The data received by the antennas is then sent over to Space Telescope Operations Control Center located at Goddard Space Flight Center. 114. From Space Telescope Operations Control Center, the data is sent over to Space Telescope Science Institute where the data is archived after it is processed and disseminated. 115. Hubble is basically a gigantic camera. However, it does not have any film. The onboard instruments capture the light that comes from different sources using electronic detectors. In short, Hubble Space Telescope is a gigantic digital camera. 116. Though all the images that Hubble has clicked so far are shown in bright colors, the actual images that Hubble clicks are all in black and white. 117. The gray-scale pixel photographs of Hubble are then taken by astronomers and put through multiple exposures using various filters. The typical filters used are RBG or Red, Blue and Green. 118. The reason for putting the photos through multiple exposures is to capture the different wavelengths of light. 119. The final colored photographs are a result of multiple monochrome images taken through various filters. 120. Since Hubble Space Telescope is also capable of seeing in infrared and ultraviolet wavelengths, scientists often add additional colors to the final images. They use deep blue for ultraviolet and deep red for infrared. 121. In late 1995 the people who operated Hubble decided to allow the telescope look into a seemingly empty strip of sky for 10 days at a stretch. 122. Many people raised questions about this little experiment with Hubble and doubted that Hubble will not show anything. 123. The critics of the little experiment were mummed when Hubble returned with an image of 3000+ galaxies that were too distant to be spotted any other telescope. 124. The image was later named as ‘Hubble Deep Field’. 125. Some of the galaxies that Hubble photographed in the Hubble Deep Field were so young that they did even enter into serious star making phase. 126. In 2004, Hubble looked into the same area but this time deeper into space to reveal an image called ‘Hubble Ultra-Deep Field’. 127. In 2012, yet another repetition of the experiment (in which, Hubble looked even further than the 2004 experiment) revealed the ‘Hubble eXtreme Deep Field’. 128. Hubble also helped astronomers to figure out the amount of time that elapsed after the Big Bang. 129. Hubble was used for measuring a special type of pulsing star known as a Cepheid variable. The measurement allowed astronomers to find out that Big Bang took place 13.7 billion years ago. 130. Did you know that the age of the universe was estimated to be between 10 billion years and 20 billion years before the Hubble Space Telescope helped in calculating the age? 131. Hubble observes a wide range of things. For instance, it observes various stars at their various stages of evolution. 132. It observes clouds of dust from which the stars are formed. 133. It also looks at the corpses of stars that have been long dead. 134. It observes stars that are half way through their life. 135. It looks outside our Milky Way galaxy as well. For instance, it has looked at Magellanic Clouds as well as the Andromeda Galaxy. 136. For Hubble, it is quite easy to observe stars. However, it is quite difficult to observe planets that orbit other stars. 137. In 2008, Hubble managed to photograph an exoplanet directly in visible light. The planet that Hubble Space Telescope photographed is called Fomalhaut b. 138. When it comes to Hubble Space Telescope’s work on planets, the telescope usually detects the atmosphere of exoplanets when they pass in front of their respective suns or stars. 139. When the exoplanets pass in front of their suns, their atmosphere filters the light from their stars. Hubble records those changes in light. 140. Hubble mostly spends time looking way beyond our Solar System. However, once in a while it also takes a look at our very own Solar System and photographs the planets and their satellites. 141. Hubble has taken some high-resolution photographs of some of our planets like Jupiter, Saturn and Pluto. 142. The only other photographs that can beat the photographs taken by Hubble Space Telescope are the planetary probes that circle these planets from some distance. 143. Hubble even photographs our very own Earth. Needless to say, the telescope photographs both the surface of the Earth and also its atmosphere. 144. Did you know that scientists use the information from Hubble to monitor the changes in Earth’s atmosphere as well as its surface? 145. Did you know that Hubble photographed the fatal crash of the comet named Shoemaker-Levy on Jupiter in year 1994? 146. The photographs that the Hubble Space Telescope clicked of that collision revealed a great deal of information about the atmosphere of the gas giant. 147. The telescope even locked on to Europa – a moon of Jupiter and found something incredible. It saw water plumes eruption from Europa. This observation came in March 2014. 148. Hubble once again looked at Europa at the same location in February 2016 and saw a follow-up plume. 149. Hubble discovered Pluto’s two moons – Hydra and Nix. 150. The Hubble Space Telescope determined the rate at which our universe is expanding. 151. The telescope also created a 3D map of the elusive and mysterious Dark Matter. 152. Hubble discovered that almost every major galaxy in the universe has a centrally located black hole. 153. Hubble Space Telescope helped in determining the exact age of the Universe. 154. Did you know, Hubble cannot really look at our Sun directly? The powerful rays of the Sun will simply destroy the sensors of the telescope. 155. Hubble cannot even take a look at Mercury. The planet is too close to the Sun and any attempt to look at Mercury will also damage the sensors of Hubble. 156. Hubble Space Telescope is housed in a spacecraft that travels at a whopping speed of 27,300 kilometers per hour or 17,000 miles per hour. That is higher than the speed of Concorde Supersonic Airliner which cruises at a speed of 2,270 kilometers per hour. 157. Having difficulty comprehending the speed of Hubble? Well, what about this? Hubble Space Telescope travels at a speed of nearly 5 miles per second! 158. The primary mirror of the telescope is so finely polished that if you could scale it to the diameter of our Earth, the bump that you can find on the mirror will be at the most 6 inches tall. 159. Every year, Hubble Space Telescope generates 10 terabytes of data. Till date, the total archived data received from Hubble is a whopping 150 terabytes. 160. The weight of Hubble as of today is equivalent to the total weight of two adult and full-grown African Elephants. 161. Shine a night light on Earth and that light will reach our Moon. Combining the sensitive detectors and its optics, Hubble is capable of spotting that light on Moon’s surface. This is possible because there is no atmospheric interference. 162. If the above point is not satisfying enough, imagine this – remove the atmospheric haze and place two fireflies at Tokyo at a distance of 10 feet from each other. Sitting at Washington DC, Hubble can clearly see both the fireflies. 163. Hubble has looked back into the ancient past when Earth was not even created. Hubble has peered at locations that are more than 13.4 billion light years away from Earth. 164. Hubble Space Telescope basically works like a time machine! You know what? Light takes time to travel long distances. So, when light from some source at a distance of millions or billions of light years away reaches the eye of Hubble, it basically looks back into the past. 165. So, when Hubble looked at Andromeda Galaxy, which is at a distance of 2.5 million light years, we actually saw how Andromeda looked like 2.5 million years ago. 166. The reaction wheels on Hubble allow it to turn at different directions. Ever wondered how fast Hubble can turn? It takes Hubble a total of about 15 minutes to make a complete 90 degrees turn. So, Hubble turns at around the speed of the minutes hand on any clock.